People are obsessed with mastering the obstacles in a Spartan race, and who can blame them? Conquering the Herc Hoist delivers that oh-so-sweet rush of adrenaline and fuzzy feelings of personal accomplishment. But once you scale that wall, climb that rope, or throw that spear, that high quickly fades as you run and run and run—through miles of woods, fields, or straight-up mountain goat trails before hitting another obstacle. If your running endurance is not on point? You. Will. Suffer. This one-month workout plan is here to help. “People spend more time running in a race than they will on all of the obstacles combined, and all of our best athletes are great runners,” says Jeff Godin, Ph.D., CSCS, SGX head of fitness education for Spartan. He also points out that being a proficient runner can improve your obstacle performance. “You won’t arrive at the rope climb completely gassed and have to stand around and rest before you attempt it, or miss the obstacle because you are too tired—then have to do burpees,” says Godin. “The technical definition of lactate threshold is when lactate begins to accumulate in the blood above baseline values,” says Godin. “This accumulation represents a transition from moderate to hard exercise intensity.” LT runs should be done at a comfortably hard pace—you should be breathing heavy and can’t really engage in conversation, you but could put a sentence together if you were crying for help, according to Godin. For longer races, there’s no progression here—your LT runs should stay the same. “Presumably as fitness improves you will be running faster and cover more distance, thus overloading,” Godin says. Do total-body workouts that focus on compound movements using heavier resistance with longer recovery time in between for your strength work. And for HIIT anything is fair game from plyometrics to bodyweight moves to tabatas. For example, if you never hit your spear throw, a good HIIT to practice would be 30 seconds of burpees followed by 10 seconds rest. Repeat ad nasueum to maximize this workout plan. Start with a four-mile run in week one and increase that distance by 10 to 15 percent each week. By race day you should be able to cover 5-1/2 miles, no problem. For longer races, Godin recommends continuing the same building pattern until you reach your recommended distance. This is the only workout in this workout plan where there’s a pass for using cardio machinery. “If you don’t have a hill, you can use a treadmill, or even a parking garage,” suggests Godin. 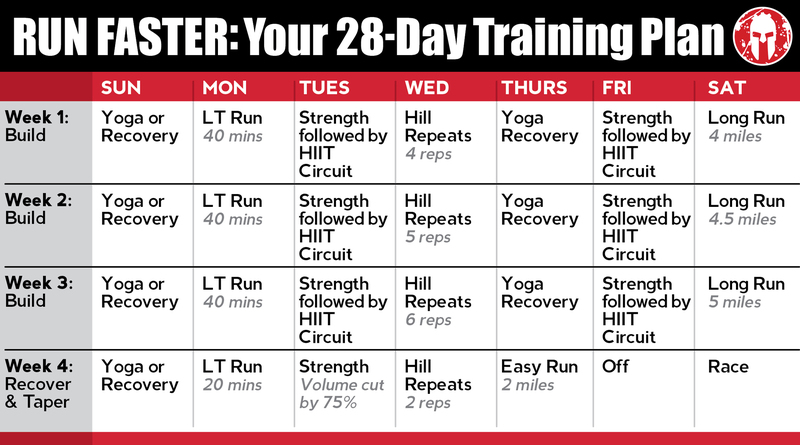 Recovery days are important for all athletes, and Godin has included two per week in this workout plan. Do something that mobilizes your muscles and joints without causing you to sweat profusely, such as gentle yoga, recreational walking, or hiking, or easy biking. This will get your blood moving, shuttle wastes from your cells and gently stretch your muscles. Supplement your training with proper nutrition. Download the free Spartan Meal Plan.